Minnesota is one of the states that's accepting Syrian refugees. 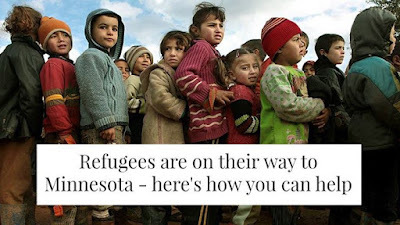 There are refugees (from all over the world) on their way to MN as we speak! The International Institute of Minnesota is helping to coordinate their arrival and gathering items that will make life a tiny bit easier. Please Note: Only the following items are being requested at this time. Winter Clothing: Coats; Boots; Gloves; Hats; Scarves. Also, if you're interested in working more closely with a refugee family, check out the International Institute of Minnesota's refugee mentorship program by clicking here. Finally, if you'd like to donate money, click here.